The Zyxel Nebula Cloud Managed Security Gateway is built with remote management and ironclad security for organizations with multiple distributed sites. 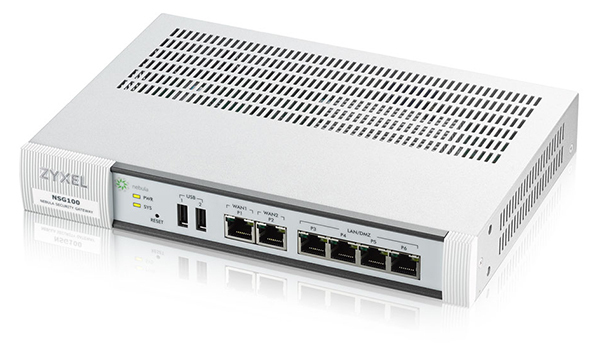 With an extensive suite of security features including ICSAcertified firewall, IPsec VPN connectivity, Intrusion Detection Prevention (IDP) and Application Patrol, Content Filtering as well as Anti-virus the NSG provides deep, extensive protection to meet everything that small- to midsized businesses need. As the Zyxel Nebula Security Gateway has been designed from the ground up to be cloud managed, installation and management is as simple as 1-2- 3. Through Nebula’s cloud interface, administrators can create site-wide policies and monitor all branch sites effortlessly, even without training. Every Zyxel Nebula Security Gateway can be quickly and easily deployed at a remote location through nearly zero-touch cloud provisioning. It automatically pulls policies and configuration settings, receives seamless firmware upgrades and security signature updates from the cloud without the need for on-site networking expertise. Traditional gateways require administrators to manage configurations and security policies separately for every device, eating up considerable time and effort. 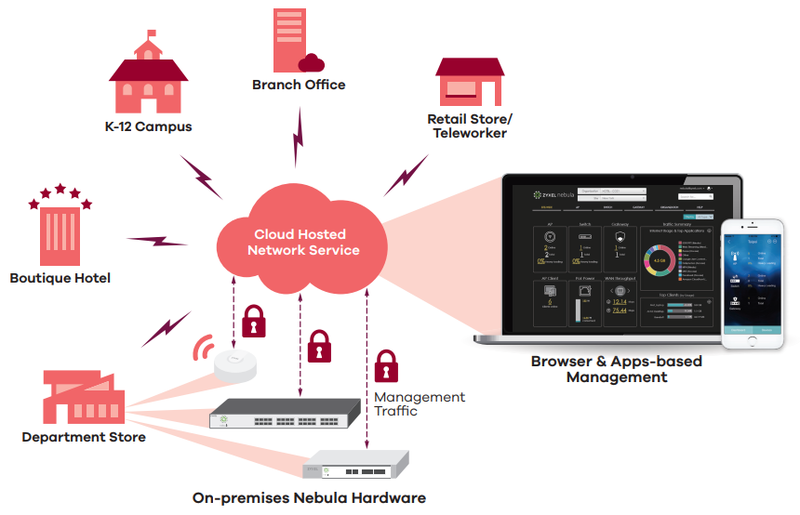 Nebula provides a single point of management for all Nebula gateways, allowing administrators to synchronize security settings across thousands of sites to every device all at once. The cloud interface provides site-wide visibility and control that enable administrators to monitor and manage event logs, traffic statistics, bandwidth consumption, networked clients, and application usage without access to the individual devices. Establishing a virtual private network to keep branch locations securely connected is easier than ever. 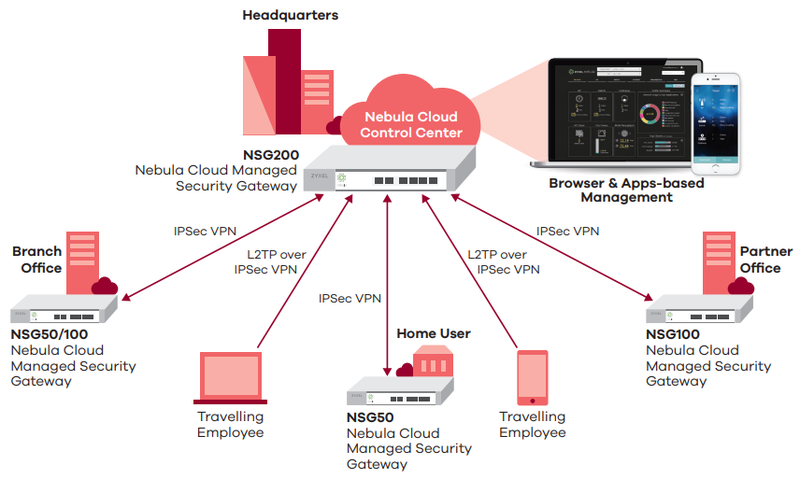 With the Zyxel Nebula Security Gateway, either site-to-site or hub-and-spoke VPN connections can be configured with just a few clicks in the Nebula Control Center and no complex VPN configuration steps. The intuitive cloud management interface lets administrators monitor VPN connectivity between multiple locations in real time. The Zyxel Nebula Security Gateway streamlines the configuration of firewalls and every security feature for faster, easier, and more consistent policy settings. It does so by supporting objectbased management and a unified configuration approach for all security related policies, with which users can easily apply all policy criteria to every security feature. Moreover, any configuration made in the Nebula Control Center can be automatically propagated to all connected Nebula gateways. Nebula’s IDP system scans multiple layers and protocols to inspect vulnerabilities invisible to simple port and protocol-based firewalls by utilizing deep packet inspection (DPI) technology that eliminates false positives with a database of malware signatures and provides effective protection against intrusions from unknown backdoors. Power input 12 V DC, 2.0 A max. 12 V DC, 3.0 A max. 12 V DC, 3.33 A max. 1 Actual performance may vary depending on network conditions and activated applications. 2 Maximum throughput based on RFC 2544 (1,518-byte UDP packets), and without enabling Intrustion Detection and Prevention. 3 VPN throughput measured based on RFC 2544 (1,424-byte UDP packets), and without enabling Intrusion Detection and Prevention. 4 AV and IDP throughput measured using the industry standard HTTP performance test (1,460-byte HTTP packets). Testing were done with multiple sessions. 5 Maximum sessions measured using the industry-standard IXIA IxLoad testing tool. * IDP and Application Patrol, Content Filtering and Anti-Virus services need to be purchased on top of Professional Pack license, and will be co-terminated separately from with Professional Pack license. Download the Zyxel NSG50/100/200 Datasheet (PDF).